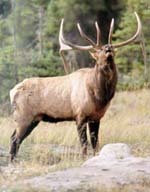 The Yukon's premier Hunting outfitters for moose, caribou, elk, bear and sheep; together with, Fishing guides and lodges. When hunting for Sheep, our primary mode of transportation is horseback. We raise our own horses, they are very gentle and no special riding skills are required. 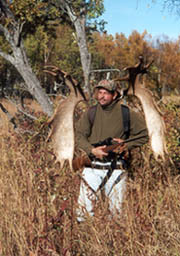 All hunting packages are complete except for your personal gear, rifle, licenses (hunting and fishing) and tags. All hunters are supplied with their own guide. Like the rest of the guides who work for us, I guide full time and we all work very hard to ensure that your hunt is an experience of a lifetime. Fishing trips are offered in the Summer, Fall and Winter. Our summer trips begin June 10. Accommodation is at our base camp on Tchawsahmon Lake (pronounced Tas-a-mone), which is only accessible by float plane. We use 14 -18 foot aluminum boats with small outboard motors for fishing on the lakes. Lake Trout, Northern Pike and the feisty Arctic Grayling are plentiful in all the waters we fish.